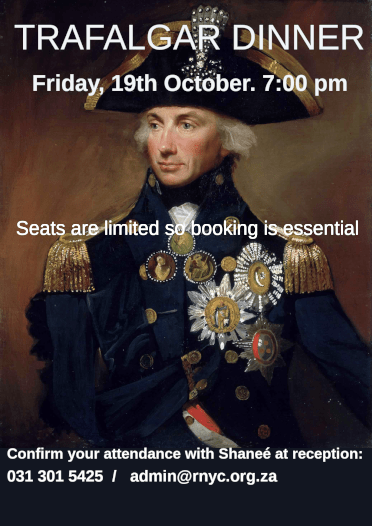 Gentleman are reminded that the Annual Trafalgar Dinner is taking place on Friday, 19th October. Seats are limited and booking is essential – further details to be announced closer to the date. This is a formal dinner for gentlemen only where we commemorate Admiral Horatio Lord Nelson’s victory at the Battle of Trafalgar. In keeping with the Club’s longstanding tradition our guest speaker for the evening is a highly talented and respected Club member, Ralf Dominick. Although not many may know of his achievements member’s will undoubtedly be entertained and be very interested in his yachting exploits which have secured his place in the record books. Trafalgar Dinner always provides a wonderful opportunity to meet the many talented members of our diverse community and this year is no exception. Of course the evening would not be the same without a sumptuous meal prepared again this year by our well known celebratory chef Charlie Lakin. Bookings are limited and we would appreciate your RSVP by no later than Friday, 12 October 2018.